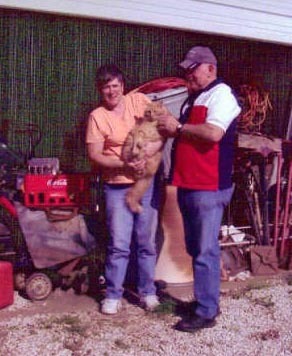 "In this photo Linn is holding their barn cat named 'Garfield'." “Karla, we got back home Thursday night around 12:30 AM. Dodged tornados, floods, washed out roads and bridges, took back roads most of the way and stayed off freeways as much as possible. We toured the Harley-Davidson Factory in Milwaukee and the Winnebago Factory in Iowa. We saw a lot of beautiful country and Linn affirmed that she is not a boat person! The pitching, rocking and rolling of the ferry as it crossed Lake Michigan was not any fun for her! 3492 miles later, we are glad to be HOME." To make a comment about this photo album, click on "Current Events" midway down the right sidebar. Scroll to the bottom and leave your comment there. No need to enter an e-mail or URL address if you do not choose to do so.